“Phnom Penh is a big, busy city where people are constantly on the go. 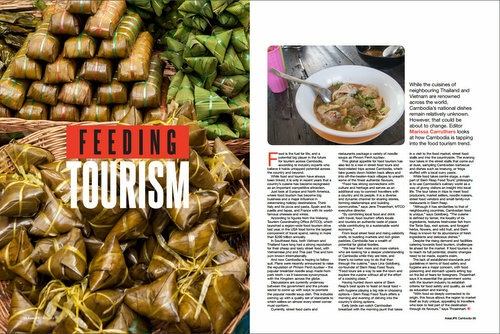 As a result, it has a far more vibrant street food scene compared to Siem Reap, where a lot of the best food is found in family-run restaurants,” Steven Halcrow, co-founder of Phnom Penh Food Tours (phnompenhfoodtours.com), a boutique tour agency specialising in small- group food tours, explains. Phnom Penh’s street food scene, however, can be overwhelming to navigate. “It can be hard when you don’t know the language, aren’t familiar with the culture, and aren’t sure how the food is prepared,” Lina Goldberg, the other founder of Phnom Penh Food Tours, shares. That’s why a guided food tour is recommended in Phnom Penh — you get to eat at hole-in-the-wall spots most tourists miss and learn more about local life from an English-speaking guide. The founders of Phnom Penh Food Tours also make it a priority to only work with vendors they know maintain high standards of hygiene. To give you a taster of the amazing food the city has to offer, Vanarith Nop, the local guide on Phnom Penh Food Tours, tells you the hidden corners where you can get the best versions of Cambodian staples. The sister tour to the longer-running Siem Reap Food Tours, Phnom Penh Food Tours offers two choices—a morning tour and an evening tour. If you have a serious interest in Cambodian street food, this is absolutely the tour operator you should use. Eat like a local and try authentic Cambodian dishes as you head out on a tuk tuk tour of the Cambodian capital’s best street food. What You’ll Eat: It’s a casual affair so it’ll depend on which food stalls are open that day. What you can be assured of is the chance to taste local specialities, including fresh rice noodles with fish curry, mouth-watering cakes made from sticky rice flour and palm sugar, and Cambodian barbeque (grilled beef is a popular choice) – alongside plenty of ice cold Cambodia beer. What Else: The three-and-a-half-hour experience will include a visit to street food stands and colorful local markets. The tour kicked off at sunset at the top of the steps of Phnom Penh’s Olympic Stadium, with a salted duck egg and a thin plastic cup filled with ice and sugarcane juice – in a plastic bag with a handle, ubiquitous on takeaway beverages in the capital. Then guests descended to the stadium market to sample nom banh chok, a Khmer comfort food of coconut broth, turmeric, galangal, sliced banana blossom, cucumber and fresh herbs on a bed of rice noodles. These and many more Cambodian staples are featured on the all-inclusive tuk tuk food cruises of the Khmer capital being arranged by the newly christened Phnom Penh Food Tours, from the expats who have run Siem Reap Food Tours since 2015. Breakfast around town with Phnom Penh Food Tours. Cambodian cuisine is an enigma to the uninitiated, and that’s partly because of a fear of three words: fermented fish paste – or “prahok”, in Khmer. Because prahok is the backbone of the cuisine, newcomers can be squeamish, and locals often aren’t very helpful in breaking that fear. 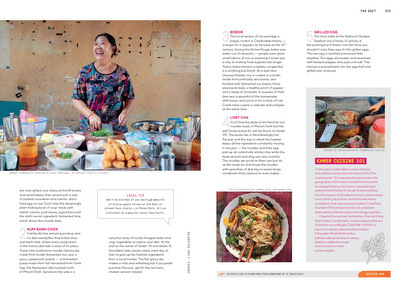 Editor Marissa Carruthers samples the flavours of the Phnom Penh Food Tours morning outing. Despite having lived in the capital for almost six years, Phnom Penh’s swathe of continental cuisine has got in the way of my experimenting too much with the even larger offering of street foods. These days, it’s even rarer that I jump off my well-worn track having fallen into the trap that comfort too often affords, routine. Comfort and routine can also make it easy to fall into the misguided mindset of thinking there’s nothing left to discover in Phnom Penh. I mean a market’s a market and a back alley’s a back alley, right? Wrong. This couldn’t be further from the truth, as my morning adventure with Phnom Penh Food Tours taught me. Cambodia food lovers are in for a tasty treat as top-rated Siem Reap Food Tour launches alternative trips across the capital, Phnom Penh. Starting this month, Phnom Penh Food Tours is offering morning and evening adventures exploring the flavours of Cambodia’s vibrant capital city. Phnom Penh Food Tours and its Siem Reap sister offer guests a deeper understanding of Cambodia’s culture through its cuisine. Following successful test runs, the official opening follows in mid May. Phnom Penh Food Tours takes visitors to neighbourhoods where Cambodians live and eat but where tourists rarely venture. Tours take small groups around the city in tuk tuks on a chef-planned route that includes vibrant markets, street-side stands and hole-in-the-wall restaurants. Guests enjoy traditional specialties and street-food treats such as breakfast noodles, smoky-sweet grilled meats, savory soups with local foraged herbs, and deep-fried fish swimming in coconut curry, in what is an extensive introduction to Cambodia food and its cultural setting. Halcrow, a Scottish chef, and Lina Goldberg, an American food writer and author of Move to Cambodia, first launched their boutique food tour business in 2014. Since then their tours have featured in the New York Times, Vogue and Lonely Planet – as well as Travel Begins at 40 – and have received consistent raves on TripAdvisor and other sites. From local street food and rising celebrity chefs, to bustling markets and rich green paddies, Cambodia has a wealth of potential for global foodies. Having hunted down some of Siem Reap’s best spots to feast on local food – with hygiene playing a big role in choosing options – Siem Reap Food Tours offers a morning and evening of delving into the country’s dining options. Early birds can catch Cambodian breakfast with the morning jaunt that takes in a visit to the food market, street food stalls and into the countryside. The evening tour takes in the street stalls that come out at dusk, sampling Cambodian barbecue and dishes such as kroeung, or frogs stuffed with a local curry paste. While food takes centre stage, a main part of Siem Reap Food Tours’ philosophy is to use Cambodia’s culinary world as a way of giving visitors an insight into local life. 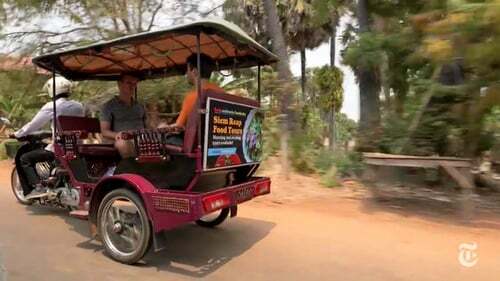 The tour takes in trips to meet food producers, market sellers, noodle makers, street food vendors and small family-run restaurants in Siem Reap. Tackling Siem Reap’s street food culture may be a daunting prospect for a new visitor to Cambodia. 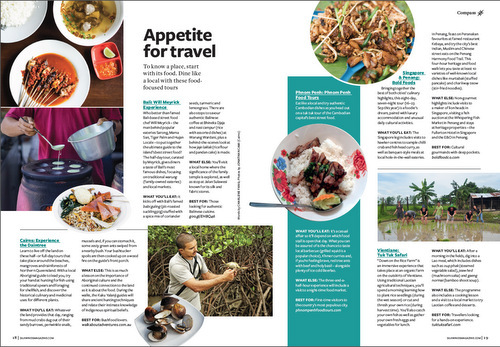 For that, there is Siem Reap Food Tours. After three days in Siem Reap, we were about to give up. We tried asking locals (they pointed us towards the touristy Pub Street for pad Thai) and we tried any stall that looked promising, but a minor bout of food poisoning later, it seemed that the Cambodian street food scene is beyond the grasp of the non-Khmer-speaking tourist. Thankfully, we booked a tour with Siem Reap Food Tours for our fourth day. Founded by Cambodian expats Steven Halcrow and Lina Goldberg, Siem Reap Food Tours offers a unique perspective into one of the least understood food cultures of South-East Asia. Street food in Cambodia is every bit as varied and delicious as that of Thailand or Vietnam. Yet whether for lack of familiarity, fear of prahok (Cambodia’s pungent super-fermented fish condiment) or hygiene worries, few visitors to the kingdom indulge. A morning spent navigating the city’s food markets and street food stalls with the Scottish chef Steven Halcrow or the American writer Lina Goldberg, the two behind Siem Reap Food Tours ($75 per person), will vanquish any doubts. Expect treats like grilled fish paste pancakes wrapped around spicy cucumber pickles, steamed rice flour dumplings oozing coconut cream, jujube fruit (red Chinese dates) stewed in smoky palm sugar and pumpkin-soy milk shakes. Pace yourself, or you’ll end up too stuffed to partake of the tour’s pièce de résistance: num banh chok, cool, slippery rice vermicelli doused with coconut-fish or chile-chicken gravy and tossed with farmed and foraged greens and herbs, all the more delicious eaten after a visit to the village where many families still make the noodles by hand.